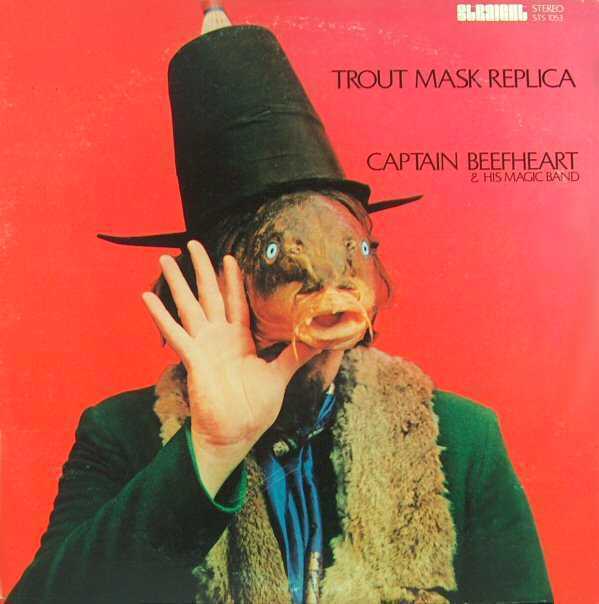 Adam: What can we say about Trout Mask Replica? Glenn: Yes, but I have a question for you fellows. When you play TMR, which songs do you skip? I tend to skip both “Hair Pie”s, “When Big Joan Sets Up,” “My Human Gets Me Blues,” and “Neon Meate Dream of a Octofish.” In fact, much of the middle of the record is a mess. Corollary question: which songs do you love, and why? For me, this record is mostly about the interplay between Beefheart’s blues shouts and the warring guitars, which should like they’ve been dipped in acid. “Ella Guru,” “Dali’s Car,” “Sweet Sweet Bulbs” have lovely guitar interaction and really unique internal structures. In “Sweet Sweet Bulbs” especially melodic shards recur in a sort of theme-and-variations. Jordy: I can just imagine some filthy hippy sitting around with his oily friends in 1969, listening to this record, and saying, “Dig it, man: this cat is way ahead of his time. This is what all music will sound like in twenty years.” Well, despite what many weirdos had hoped, this has not been the case. In fact, TMR still sound about as weird as anything I’ve ever heard. And I agree with Glenn about the relative palatability of the middle portion. Starting around “Bill’s Corpse” by eyes glaze over. This is especially the case when Beefheart isn’t singing. While the whacked-out rhythms are interesting they seem secondary. It’s Don Van Vliet’s inimitable yowling and word associations that make this album such a gem. I particularly like “The Dust Blows Forward…” and “Old Fart at Play.” (Also I think Antennae Jimmy Semens is a really cool name). I think we’ll all agree that TMR is best when it’s “accessible” and “melodic” — “Pachuco Cadaver,” “Moonlight on Vermont,” the aforementioned tracks — but after taking another couple listens the past few days, even those accessible, melodic songs are genuinely odd. The back and forth guitar spittle on “Ella Guru,” the weirdly timed bassline at the beginning of “Pachuco Cadaver,” the slippery blues licks that seem to be falling apart on, say, “Fallin’ Ditch,” most of the lyrics — but these “far-out” elements often sound absolutely right in context. Adam: I also have a hard time listening to this album all the way through. I find the instrumentals especially tedious. In terms of stuff I actually like, “Moonlight on Vermont” is one of my favorites, and I also like “Dachau Blues” and “Ant Man Bee.” And the spoken pieces like “The Dust Blows Forward and the Dust Blows Back” are good too. Do any of the other lyrics stand out in anyone’s mind? Finally, if we’re going to debate which band member has the coolest name, I’d have to go with The Mascara Snake, with Drumbo coming in a close second. What’s it mean? I’m not sure. But there’s an image there, surprising and odd and beautiful: cracking apart a bright mirror to see the dark paper inside. And then the negative of that image: bright moon glimpsed through darkness. And I’m a big fan of the lyric to “Frownland.” It’s either a kiss-off breakup song, or a middle finger to the frowning straight world. Oily hippies unite! This post would not be complete without a tip of the hat to John “Drumbo” French, whose role is the Magic Band has been debated and distorted. It seems he is somewhat responsible for the the existence of the difficult (and, to my ears, beautiful and fascinating) instrumental compositions. In his words, Drumbo “…transcribed most of Trout Mask Replica in conventional music notation, and then taught it to the band.” You can tell — at times, the galloping but solid drumming seems to lead the band. We can wait for Drumbo’s memoir to come out later this year for more insight into the surely insane creation of this classic. On a future listen, try whacking the bass way up, and then concentrating on that. I’ve found that even the most inaccessible musical passages seem to fall into place around it when I do that. I don’t skip any of TMR; I think of it as a puzzle that I’m gradually solving, piece by piece. I know the critics are always repping TMR as his most important record, but for my money I’ll take Safe As Milk. Johnny, my blogmates probably prefer Safe As Milk, but I always reach for Trout Mask Replica (or the absolutely killin’ live album I’m Going To Do What I’m Going To Do: http://www.amazon.com/Im-Going-Do-What-Wanna/dp/B0000DJYPM). Good to hear from you. Safe as Milk is my favourite. In fact, it’s in my top 2 records of all time. 1.) First of all, the recommendation about turning up the bass is CRUCIAL. Mark Prindle’s recommendation is at first to even bob your head around to the drum beat, until you learn to recognize it (so I actually turn up the highest frequencies as well). The problem is that the vocals are too loud and not in-sync enough with the band and they bury everything (Zappa’s own albums have this effect). But I have to absolutely disagree with the dislike of the instrumental parts–they’re the whole album as far as I’m concerned–free-jazz as tightly-composed blues-rock!!!!! Vliet is just the icing on the cake. 2.) This record takes TIME. I first heard this album over 4 years ago and I thought “this is like Ornette Coleman, the guy is way smarter than me and I will never be smart enough to like this,” one year later I heard it and thought “oh my gosh this is really fascinating–but I don’t want to listen to it very often,” a year after that I listened to it again and was into it and nothing but it for almost a week–I got it! Every jagged, awesome-sounding, dissonant-yet-melodic-in-a-way-if-you-think-about-it guitar part from the Fall’s greatest period (1980-1982/3) COMES FROM THIS RECORD! The guitar players will both be playing blues-scales, but one of them will be a fifth or a fourth above the other, creating a stacked harmonics that is SO refreshing after 400 years of third-based music–really forcing the listener to listen and also making it enjoyable. Then I put it away. This year I’m TOTALLY obsessed (we’re going on two months and I’ve only just now started putting other music in the rotation)–this is the kind of music I’ve always wanted to play and THE kind of music I want to listen to! 3.) You can’t skip any of the songs, Glenn, except “China Pig,” “The Blimp” and maybe the a-cappella stuff, if you’re in a pinch. Both “Hair Pie”s, and “Neon Meat-Dream of a Octafish” in particular are some of my favorite tracks–again, the instrumental war between the guitars is really what sets me off here. Who plays like that? Where do you hear people trying so hard to get away from traditional harmony and still use blues-based melody besides Coltrane or Ornette Coleman? It’s harmonically and melodically fascinating. Seriously, every math-rock group in the world is doing a Hair Pie (the descending scale under the chords at one point, followed abruptly by the eight-note-to-triplets dissonant line “da-da-da-da-da, dippity-dat-da-da”). At first I wasn’t into “Bill’s Corpse” that much, but the dissonant chords drew me in (despite the less-than-lovely vocals at the beginning), “Pena” bothered me for a little bit too. The only song I still don’t like that much is “Ant Man Bee” which bores me due to the seeming guitar-truce (to borrow Glenn’s metaphor again). “When Big Joan Set’s Up” is not the best song, but the pulse and rhythm is fantastic. 1.) “Frownland” (the PERFECT guitar line at the beginning–not minor, not major, it has overcome this distinction), fairly serious lyrics about isolation, human solidarity friendship, etc. Sorry for the long response. This is my favorite album in the world right now, so, you know. “Lick My Decals Off, Baby” is also an awesome album in much the same style although with better production and the sad replacement of one of the guitars by a marimba–still great stuff though, but not as consistent. “Woe-Is-Uh-Me-Bop” and “I Love You, You Big Dummy” are, I think, possibly the two greatest musical compositions… ever. The very definition of audacious genius. I retract my detraction of ant man bee completely and aim it squarely at “when big joan sets up” too long to be doing that thing. “Wild Life” really does it for me these days, for some reason. At it turns out that Clear Spot and Spotlight Kid are both half good! Mat Graining, who is the guy who invented The Simpsons. I heard him explaining his experience with TMR. It pretty much resembles my own experience with the album precisely. Wow!, great! a double Beefheart album. If it is anything like ‘safe as…” or “Stricty Personal” it has got to be great. I bought it, rushed home & put it on the turntable and …Oh! Christ!… These guys are not even trying! This is terrible. After three days, I realised that I could not stop playing it. It had become my favourite record of all time. Forty odd years on and it still is!